The term “cannabis” can be scary to those who have never used the plant before, and the cannabis dispensary can be even more overwhelming. With all of the options, different claims and foreign technical verbiage, an overwhelming trip to the dispensary can prevent the average person from visiting again in the future. Despite the rise of cannabis dispensaries in the US, cannabis dispensaries have been prevalent long before any of us were born. Ancient healers, in countries like Egypt, India and China, distributed cannabis and other natural herbs to their patients in efforts to cleanse them of their impurities. Although the western world has met these dispensaries with some resistance in the past, dispensaries today have taken off and are now creating economic opportunity. In Colorado alone, cannabis dispensaries outnumber Starbucks and McDonalds. And the national market shows no sign of stopping as it is estimated that in 2024 the cannabis consumer market will reach 37.3 billion U.S. dollars. But despite the craze, exactly what is a cannabis dispensary? True to its name, a cannabis dispensary is simply a store where cannabis is dispensed or sold. In the US, there are two general categories of cannabis dispensaries: Adult-Use and Medicinal. Adult-use dispensaries specialize in recreational purposed cannabis. Like restaurants? Well, they do have the menu for you. On this menu, you’re likely to find over 20 types of cannabis strains, with more than 50 edible selections, vaporizers, and other goodies. Flowers may range from indica to sativa and concentrations can range from BHO to CO2. At an adult-use dispensary, you may be greeted by a store attendant referred to as a budtender. These budtenders should be equipped with the knowledge to help you find what you need. Due to the overwhelming abundance of growing information about cannabis benefits and consumption, we encourage all patients and consumers to take some time and perform their own product and information research. Medicinal dispensaries specialize in providing cannabis to treat ailments and disease. Therefore, patients may be required to have doctor recommendations. Unlike adult-use dispensaries, medicinal dispensaries may resemble a doctor’s office. And in addition, many medicinal dispensaries must operate as nonprofits. Since medicinal cannabis is not taxed the same as adult-use cannabis, the cost of medicinal cannabis may vary. Despite this price difference, you may be more likely to find medicinal dispensaries than adult-use ones, as 29 states allow for public medical marijuana and cannabis programs and 17 of these states allow the use of THC for medical reasons in limited situations or as a legal defense. As with any popular trend, locating services soon follow. Services such as Leafly, the MJ Directory and MerryJane help to highlight legal top dispensaries across the states based on various arrays of metrics. The 25 top rated dispensaries across the US, have names such as Lightshade, Calvia, and Airfield Supply Co. We’ve provided a basic map for your convenience below. However, before choosing which dispensary to attend, it is recommended to identify what symptoms or concerns you are looking to fix or address; kind of like forming a grocery list before a visit to the supermarket. Once you have identified your needs, you should prepare for the following. Given all of the intriguing information above, I recall my first experience with a cannabis dispensary, and it didn’t go as planned. Upon entering, the budtender asked for my medical card to process my admission and after that, access was granted for me to venture behind the gatekeeper. Upon entering, I was introduced to a variety of options to pick from, some of which I’d never heard of at the time. The range expanded from topicals, to tinctures, to rubs, to bath balm, to vape pens, and more. At the time, I had no idea what THC, CBN, cannabinoid ratios, C02, BHO, and Carrier Oils meant; and despite this variety of selection, the budtender was unable to help me as thoroughly, due to the limited amount of time that one could stand in a busy dispensary line with other customers patiently awaiting service. Therefore, my initial trip to the dispensary could have easily turned into a hassle which could have been avoided with a little more research. However, from this experience stemmed the inspiration for James Henry SF, an easily understood lifestyle brand that offers relief for any part of the day with an essence of variety to address various needs. From my unique experience at the dispensary long ago, my team and I created simple, but effective formulations to harness the trip to a dispensary in one go. We’ve developed products that take the guesswork out of your dispensary search, allowing you to take back your day. As cannabis continues to be legalized across the US, how will you identify the cannabis best for your needs or differentiate between its many uses? The first step in this array of questions is to of course perform research, and we’re here to help you with that. This post will help you to understand the basics of CBD, THC, and CBD: THC ratios, as well as help you understand when each solution is optimal for use during different parts of the day as well as which product is a best-fit to help relieve various symptoms. Cannabinoids are chemical compounds secreted by cannabis flowers that, in previous times, were thought to have no primary role in a plant's development. However, it is now hypothesized that these cannabinoids act to defend the plant's immune system from outside intruders. When consumed, cannabinoids imitate the body’s natural endocannabinoids, which are crucial to maintaining our internal wellbeing. They function to mediate communication between the body’s cells but have different effects based on their binding receptors. Two examples of primary cannabinoids are CBD and THC. CBD provides medicinal benefits whereas THC creates psychological effects that produce short-term feelings of euphoria, nostalgia, and other associative benefits. 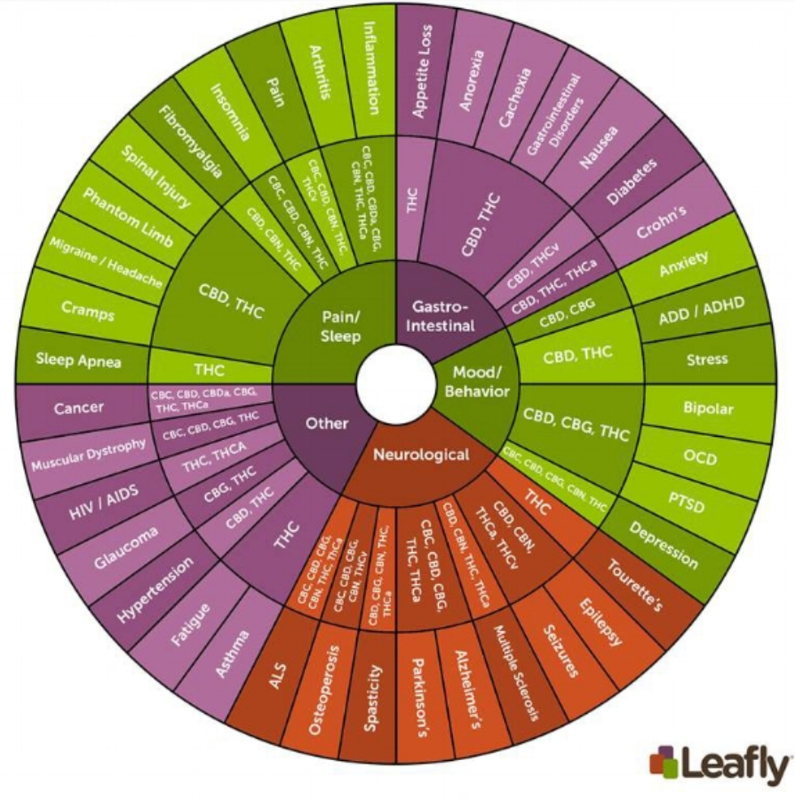 Below is a wheel documenting the effects of CBD and THC. Imagine the caffeinated indulgence of a freshly brewed cup of coffee, minus the jitters, with a side of calmed nerves. In small amounts, CBD can create an energizing effect, which is ideal for the morning hours. And as the most active cannabinoid out of 113 cannabinoids, CBD has been shown to be a non-psychoactive substitute for caffeine cravings. Medicinally, CBD has been proven to have neurogenic and neuroprotective effects and further research suggests that CBD is safe even at varying dosages. THC binds to receptors within the brain and central nervous system in order to produce euphoric and relaxing effects. Therefore, THC can be a key leisure supplement and multifaceted solution to a good night’s rest. This cannabinoid, and its accompanying profiles, provides effective experiences that are great to relax at home, watch a movie, or listen to your favorite music. THC has also been shown to provide relief for over 23 medical conditions and ailments, be effective in chronic pain management, and most notably, destroy cancer and tumor cells. However, whether consumed as an edible or vaporized, individual responses to THC can vary, and trial and error is best to determine personal limits. As CBD can lessen stimulating effects of THC, a greater ratio of CBD-to-THC produces less stimulation. Therefore, popular demand for recreational use seems to favor ratios with higher THC. Because of this, the typical products in your local dispensary may have THC: CBD ratios as high as 20:1 for flowers and 80:1 for concentrates. Nonetheless, studies have shown that participants experienced more pleasurable effects and less anxiety with the combination of CBD and THC than they felt with THC alone. Therefore, in determining the best dosage, users usually start with the most proportionate 1:1 ratio and alter from there. You can now see why we find value in the use of cannabinoids. From their medicinal healing properties to their ability to enhance a good time, we find value in creating whichever experience you choose, just for you. Therefore, we’ve taken the guesswork out of ratio experimentation and have created product lines to fit your needs. Whether you seek to take advantage of the morning CBD energy with our Daytime: Focus product or relax and enjoy social occasions with our Evening: Social product or benefit from the relaxing effects of THC concentration with our Weekend: Retreat product, we’ve formulated the ratio for the optimal time. Join us as we experience the benefits of CBD and THC to create added benefits for the body’s overall well-being.